There is a vast choice of card making adhesives on the market, from foam pads to glue dots, and it is trial and error until you find the ones you enjoy working with. 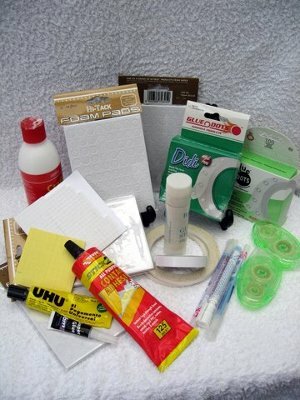 Pictured are just some card making adhesives, but many of my favourite ones are featured in the video. Try different kinds, until you find the ones you prefer. But it needs to be a good glue as the last thing you want are bits dropping off your card, especially if you want to sell them! This short video will help you to see the difference in the types of glues and some of the ways you would use them. When you are placing paper onto the card, then a wet glue is easier to re-position, should you make a mistake. PVA is useful but you will need to allow the card and paper to dry before you continue. It's a permanent, general purpose glue that holds well and it dries clear, but it does tend to pucker the paper. Contact glue can be worked with straight away, you don't need a vast amount of it. But it has a strong odour so make sure you have plenty of fresh air. Just run a line down each edge and some dots in the centre. Place your paper on and then run your hand all over to set the paper in place. Spray glue is another good adhesive, and with some of them you will be able to peel the paper off again, for a short while, if it's not quite straight, and then press down firmly when you are happy. Double sided tape is less messy, and comes in lots of sizes, but is very unforgiving, because once your paper is down ....it's stuck .... permanantly and if it isn't on correctly there is not a lot you can do about it. Glue sticks, are useful for sticking on small elements to your cards... but the little glue pens are much more manageable. Matting and layering needs adhesives to, and this can be done with any of the types of glues mentioned. mat and layer a different level, very effective if each layer is in a lovely colour, to contrast or blend. 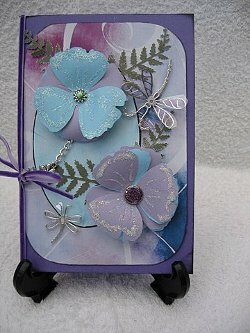 When you are adding toppers to your cards, then use the foam pads to raise them from the card, giving a 3-D effect. These useful little card making adhesives come oblong, round, square, big, little, black, white, thick and thin, the choice is yours. Decoupage also benefits from the raised effect, and for this you use could either the foam pads or silicone glue. Placing a large blob of silicone from the tube into an old plastic lid, and then using a cocktail stick to pick up small amounts works best and makes it easier to place it on the card. Once the silicone has set it is very reliable, and the remainder left in the old lid can be peeled out and the lid re-used. These flowers have been built up, and then attached to the card with silicone glue. But if you get some onto the front of your card it will be spoiled as the silicone won't rub off. The Dragonfly is a peel off mounted onto acetate, and has a small piece of foam pad behind the body. The wings are then bent up, slightly, to give movement. These are indispensible when you want to add small gemstones, or glitter up some words. This goes on blue, but dries clear and un-noticeable. Folllow the outline of the words you want to use with the glue pen and then sprinkle on the glamour dust for instant sparkle! Fabulous. But my absolute favourite is the very versatile "Pinflair" Glue Gel. It stays in the syringe for up to six weeks without setting, and up to five years in the tube. And you will find it is the best glue to stick your toppers to glitter card. And last but not least in really useful card making adhesives, is the humble glue dot. These again come in all sizes, fabulous for forming bows, or attaching lace or ribbons to your creations. Another creation "Handmade by ....your name"